On February 10 at around 9 PM, Richard Pallardy was walking home to his apartment near Fullerton and Sacramento from a swim at Logan Square’s Kosciuszko Park. Strolling south on Kimball, the 33-year-old freelance writer began crossing Wrightwood in the crosswalk, with a walk signal. As he did so, a northbound driver made a sudden left turn on Wrightwood and struck him. “The car crashed into me, sent me flying, and took off,” Pallardy said. The driver fled west on Wrightwood and disappeared into the night. Pallardy landed on all fours, and hit his face on the ground. He suffered a broken nose and cheekbone, a split lip, a sprained wrist, battered knees, and various cuts and abrasions. His low-cost health insurance plan requires him to pay about $3,000 toward his hospital bills, he’ll be out roughly another $1,000 for the ambulance ride, and he may eventually need more surgery because he hasn’t fully recovered his sense of smell. Still, Pallardy was relatively lucky. Unlike many crash victims, he survived. And yet his case is representative of Chicago’s larger hit-and-run problem. 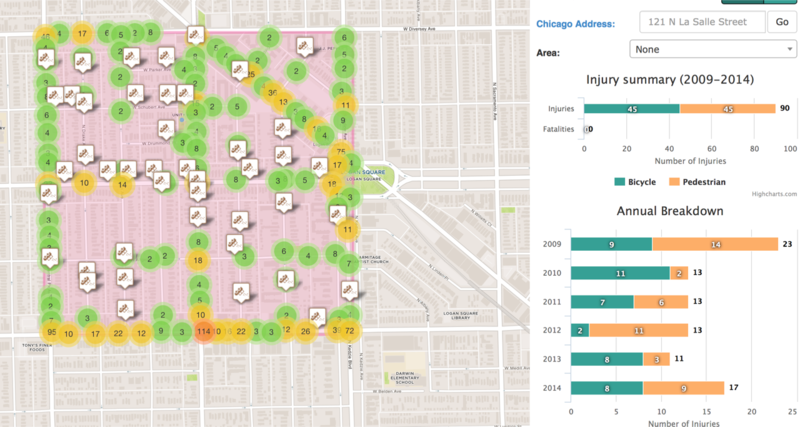 As I noted a year ago, when 34-year-old mechanic Christopher Sanchez was killed in Avondale, 40 percent of Chicago pedestrian fatalities between 2005 and 2014 involved drivers who fled, according to Chicago Department of Transportation data. This issue has continued to be a persistent problem since then, and although the driver who hit Sanchez was apprehended, bringing offenders to justice is often an uphill battle. While there were a few witnesses to Pallardy’s crash, no video has been found yet, and no one seems to have taken down the driver’s license plate number. Bill Lustro, a deliveryman who was driving down Kimball behind the hit-and-run motorist, described the car to police as a dark-colored, perhaps blue or black, two-door coupe, possibly a Nissan, with a small spoiler. Pallardy and other witnesses say the vehicle may have been silver. But the Chicago Police Department has yet to identify the driver, and Pallardy says that so far dealing with the police has been frustrating. Responding officers—who didn’t arrive on the scene until 20 minutes after the crash—told him he would be called the next day, but that didn’t happen. When Pallardy contacted the 14th District police station soon afterward, he says he was told to call CPD’s Major Accidents Investigation Unit. Pallardy says that an officer there initially told him that it was unlikely the unit would receive paperwork from the 14th District in time to access nearby security camera footage before it was erased. “When I pointed out how problematic that was . . . he reversed course and said it was possible there still might be footage that could be viewed,” Pallardy says. CPD’s Office of News Affairs says the investigation of Pallardy’s crash is ongoing, but didn’t respond to other questions about the case. Pallardy also e-mailed his alderman, the 32nd Ward’s Scott Waguespack, 35th Ward alderman Carlos Ramirez-Rosa, and state rep Will Guzzardi, whose districts include the crash site, asking them to contact the police and encourage them to actively investigate his case and add traffic enforcement to the area bounded by Fullerton, Kedzie, Diversey, and Central Park. “I constantly see people speeding and blowing stop signs at full speed in that area,” he says. Read the rest of the article on the Chiciago Reader website. 1) Rosa is auditioning for his next job, not the one he has. His staff is not helpful, and he obviously responded because something made him look bad. Ugh. 2) We often debate here about the need for enforcement. This is where I think police energies should be, not ticketing bike lanes. If police are out doing general traffic patrols, they might catch some hit and run drivers in the act. After a crash, it is the responsibility of detectives to investigate. This doesn’t need to be an either/or situation. I think that a huge fleet of undercover bike cops would make a world of difference! But they need to look like regular people biking. I’m only half surprised about the ineptitude of the Major Accidents (Collisions) division. There was a major drunk driving crash outside of my home to which I was a witness. They were pretty on top of it as far as getting it charged ASAP. I did a line-up and interviewed with the State’s Attorney the next day. However, now that I’m be called to testify, I have realized that they failed to gather video evidence from the businesses that faced the scene or canvass for other witnesses inside said business. I brought these sources to the attention of the prosecutor who had zero knowledge of them. This was in October. The direct CPD response to what I believe was 50+ MPH crash was about 30 minutes (a disgrace) and I think a lot of evidence and witnesses were lost because of it. Ticketing vehicles in the bike lanes could be handled by the “Meter Maids” like in the old days. The police shouldn’t be need for a parking ticket. We should be doing what the SFMTA does. This last sentence in the article is great advice: “If you get struck by a driver who flees, you shouldn’t have to retain a lawyer in order to have investigators search for the culprit in earnest.” What motivates CPD to get things done? Do they only investigate in earnest if the victim dies? Follow John’s advice and get a lawyer!